This entry was posted on May 17, 2016 by Texas Safety Supply. Ansell Hyflex Gloves are a cost effective great choice when selecting a work glove for assembly operations and job tasks the require that handling of small parts and electronics. Best Cut Resistant Gloves and Ansell Hyflex Cut resistant gloves are a couple of Industry Favorites. The number one quality of Hyflex Gloves is the ability these hyflex gloves give the user in the dexterity which allows them to handle small parts and electronics. Coated Ansell Hyflex gloves give the user a better grip, making it easier to pick and properly place small objects exactly where they need to be for the wearer of these work gloves. This is why Ansell Hyflex Gloves are commonly referred to as "Assembly Gloves" and sometimes even as "Mechanix's Gloves". Regardless what they are called they are Ansell Hyflex and are a great choice for many job operations. Ansell Hyflex gloves are comfortable to wear and are a favorite and the glove of choice for many folks on the job handling assembly operations. Ansell Hyflex Gloves also have many styles within the Hyflex brand name of gloves that are designed as Cut protection Gloves. Assembly gloves differ slightly in that assembly work gloves will provide the dexterity that is the key priority versus the Cut protection gloves where injury prevention is Key. Ansell Hyflex Cut protection gloves can be found here and purchased directly from Texas Safety Supply. Ansell Assembly gloves have additional options and styles discussed below. Ansell’s Hyflex 11-800 original foam nitrile coated work gloves is designed channel oil away from glove's surface, away from the fingertips to the exterior portions of the palm of the hand. The Original Ansell Hyflex Glove with tremendous, unmatched comfort for workers. 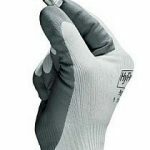 The grey foam liner over the Nylon liner hides dirt and prolongs the lifesapn of the glove. Although not designed as a Cut resistant glove the Ansell Hyflex 11-800 offers ANSI Cut protection of Level 1. Ansell patent pending Grip Technology coating goes to work in the Ansell HyFlex 11-920 to allow oils and lubricants to transfer away from key grip areas of the Ansell Hyflex 11-920. A Nitrile coated Hyflex Glove that helps improve grip in oily enviroments while handling parts that may be coated in a light layer of oil or lubricants. These Ansell HyFlex 11-920 Work gloves Increases surface contact for enhanced grip and control while Preventing oil penetration, and reduces the risk of dermatitis and liquid exposure. The design of Hyflex 11-920 is a multi dip process versus one dip of some other brands that extends the life and use of Hyflex work gloves. Although not specifiaclly designed for Cut protection the Ansell Hyflex 11-900 work glove Provides good snag, puncture and superior abrasion resistance. A good choice when there may be some minimal exposure to snags and abrasions in assembly operations. 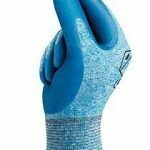 The Hyflex 11-900 reduces oil penetration, which minimizes the risk of dermatitis Excellent grip in dry environments, Breathable stretch knit liner, These work glove molds naturally to the hand, decreasing fatigue. A Nitrile Coated glove which resists snags and a Cut level rating by ANSI of 1. Ansell Hyflex 11-600 are part of the Hyflex work glove family and have a Polyurethane palm coated exterior. Many handling assembly operations request these hyflex gloves beause of there maximum dexterity. These Hyflex work glove provides maximum tactile sensitivity in the finger area for an exceptional feel. These work gloves have an Excellent fit and perform to maintain high productivity in the workplace. 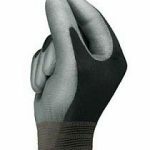 Ultra-cool stretch nylon liner on these Hyflex 11-600 work gloves provides barehand like dexterity. A cool, breathable liner make them a solid choice for hot, humid work environemts. The Hyflex 11-600 have an ANSI cut level rating of 1. Ansell PowerFlex® Medium Duty Cut resistant Work Gloves are coated with special purpose foam that delivers high levels of flame resistance, arc flash and cut protection in one ergonomically designed product. The DuPont™ Kevlar® liner and Knitwrist offers superior comfort, dexterity and flexibility. Cut resistant Gloves have soft foam coating, ensuring a secure grip in wet, oily and dry environments to reduce slippage and tension to the hands. These cut resistant Gloves have major applications in equipment operation, track laying, cutting, crimping, soldering, pipe fitting, vehicle, machinery and heavy equipment maintenance. Ansell Hyflex work gloves are a great option for warehouse operations requiring delicate handling and placement of parts during assembly operations and they also are very easy to wear, a comfortable work glove that makes the Ansell Hyflex Glove a favorite of so many.